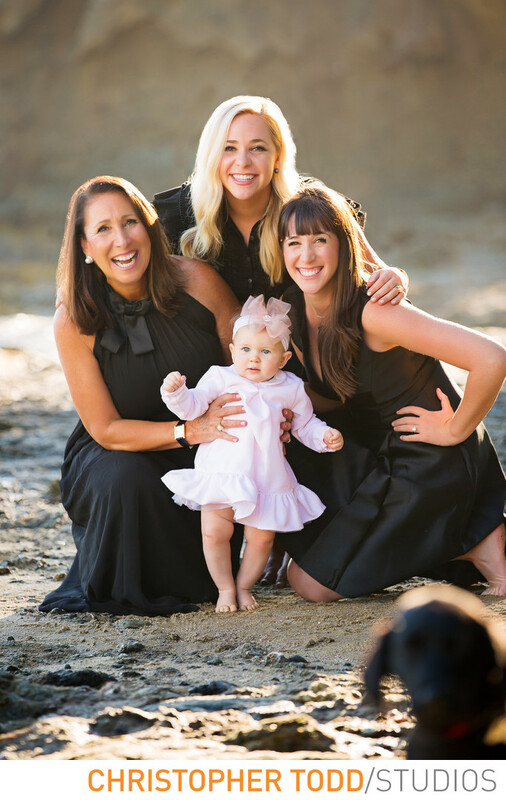 Family photography in Orange County can be taken all year round. We have some of the best weather in California that allows us to take beautiful photos outdoors. This Orange County family wanted their portraits taken at the beach. One of our favorite locations is at Montage Beach in Laguna. The ladies wore classy black dresses and the baby girl wore a cute pink dress with a big pink bow on her head. In the nearest corner of the photo you can see the family dog entering into the frame. Spontaneous moments like this create genuine smiles and laughs creating great photos. Location: 30801 Coast Hwy, Laguna Beach, CA 92651. 1/100; f/4.0; ISO 100; 170.0 mm.